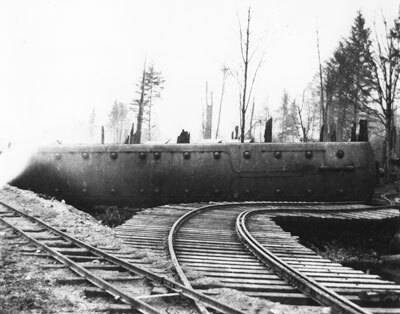 View of derailed Pacific Great Eastern train laying on its side near train tracks. Scanned December 2011 using Epson Perfection V700 Photo at 300dpi and 100% of original image size. Alternate Versions: Lossless TIF from original scan at 300dpi and 100% of original print. W24 x H19 cm black & white print on photo paper.